Stop leaving your wings in the car, Monkey. Hey folks, I haven't forgotten about you. I am still waiting for my damn employee to bring by his soldering iron. I feel stupid buying one when I already own one, you know? Cool I'll start building my 3D plane today. Soldering irons are like guns. One is NEVER enough. I have 2 Antex Precision with many different tips, One Weller Micro, Several Uber cheapies, A couple of OLD temp controlled stations and one hot air / precision temp controlled rework station. I typically use the Antex precisions and the hot air rework station for nearly everything though. Well, after killing my AXN this weekend, I entertained the thought of buying a new plane. Then it dawned on me that I have two sitting on my table, waiting to be built. So, that is what I worked on this Sunday. I started out the day by working on the e-hawk 1500. It is beautiful, but since it is discontinued, I am afraid to fly it. Luckily, it isn't very tempting because I've managed to misplace the spinner that came with it. 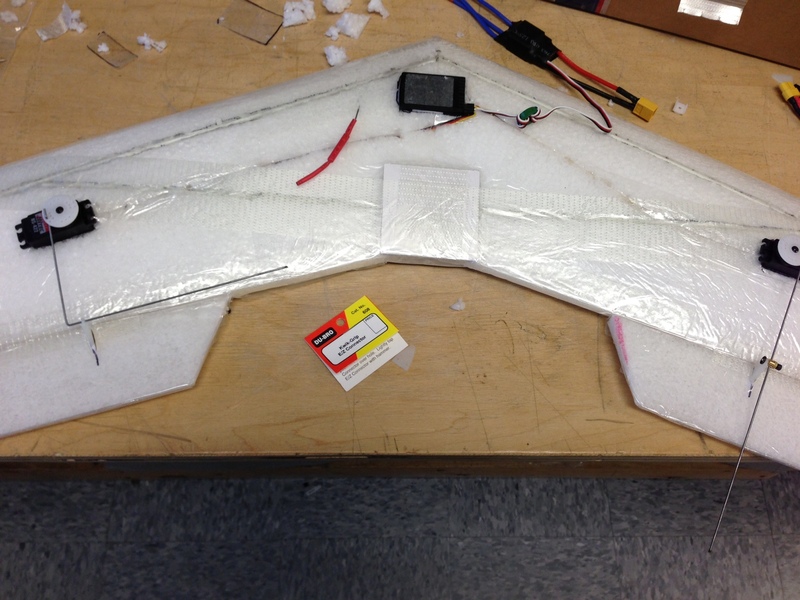 I've got another on the way, so I should be able to maiden that soonish. Still, scary. Then, I started working on Bob the Titan. It took me a while to get comfortable with the idea of melting so much foam away, but it's pretty fun. I managed to get it all glued and ready to go yesterday, and my wife has offered to help me pick out a color scheme... That should prove interesting. 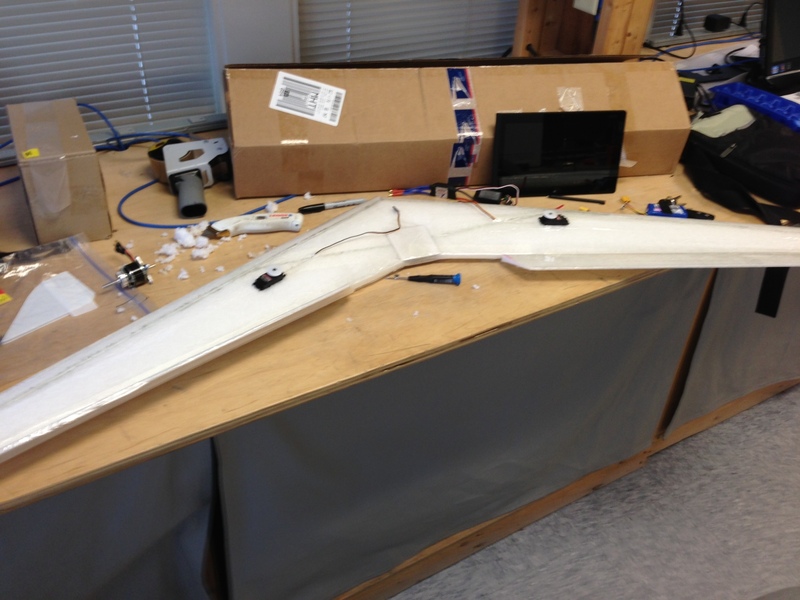 I also tested the servos and ESC's for both planes. It was a productive day! How can you kill a floater jet? it ate itself in a shower of epo confetti. I posted a thread about it in the sport/beginner forum. It killed itself in a canibalistic 'asplosion. Taped up the titan tonight. I honestly thought the rhetoric on their web page would be crap, but it is true. 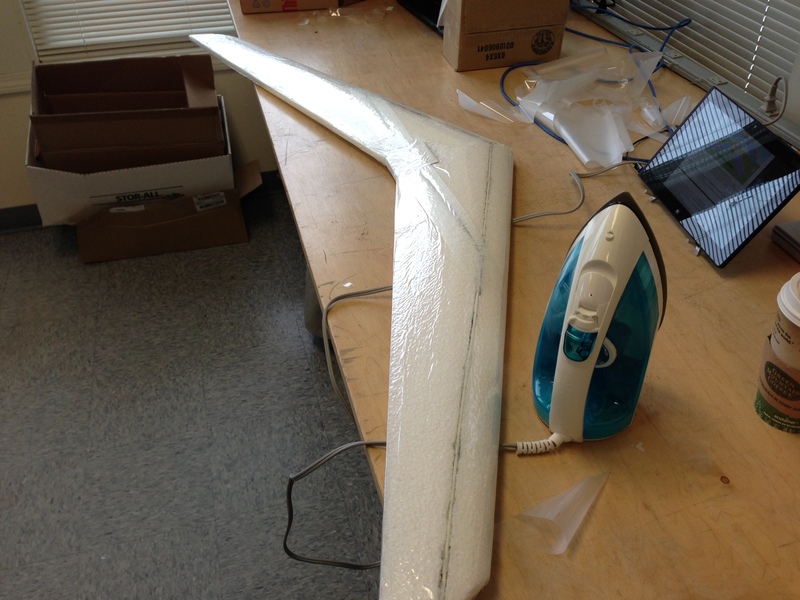 You tape this flimsy foam wing, and it is solid. It makes a thump when I set it down on my glass table. It makes a thump when I set it down on my glass table. ....thumps are a good thing....not quite as good as thuds but still a good sign "shes solid"
when are we going to see it fly ?? 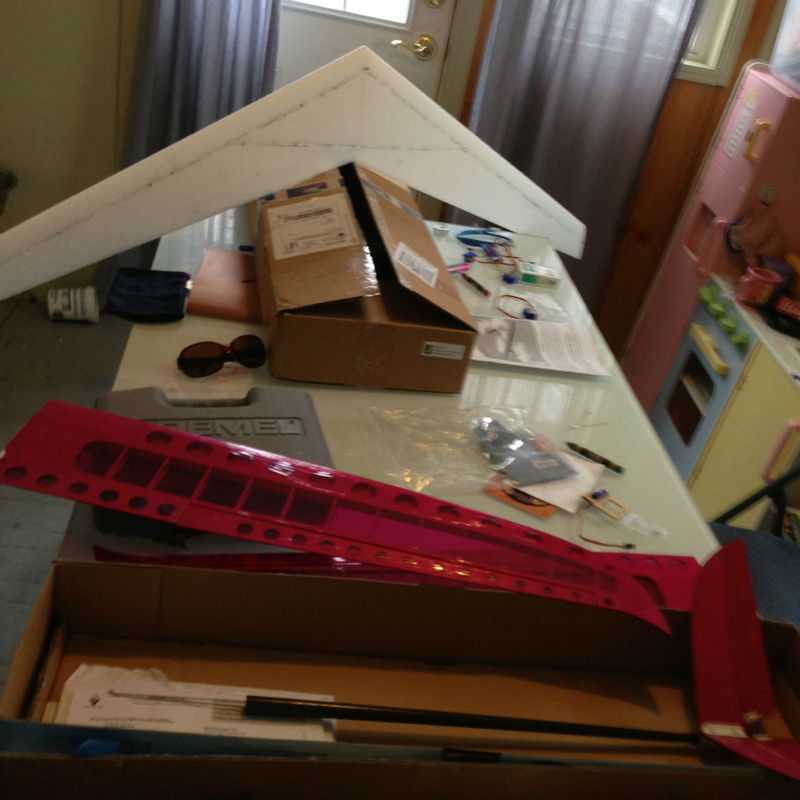 I feel like I should finish building it before I attempt to fly it. 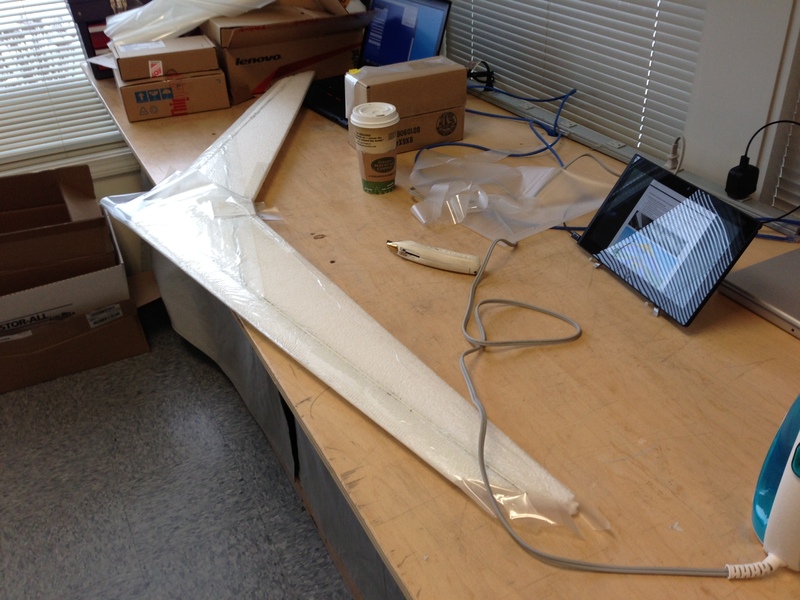 I am hoping to finish the build this week, and weather permitting, fly it this weekend. Mine did too on its first flight. It has had a nose transplant and a brushed (yes you read that right.) Conversion to a motor glider. It's always flying, because it is too hideous to be seen at close range. So, I've lied a tiny bit. I built the FT Delta first. In my defense, it was very, very quick. I used the internals from my AXN, which is now quite thoroughly dead. Yes, I've used my son's crayons to "paint" it. I was very nervous with applying the laminate for this plane. 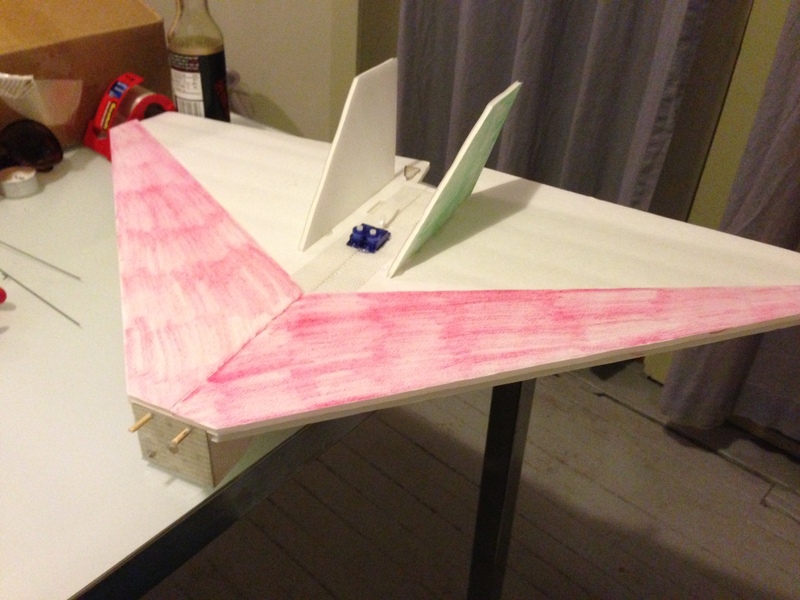 I am just not very experienced with building r/c planes. I second guess myself a lot. I needn't have been worried. It was very easy. Yes, I used a clothes iron. It worked quite well. I found that as I ironed, it all tightened up nicely. Yeah, I kinda freaked out with servo location. Eventually, I bit the bullet, and cut out the slot. I've worked the servo leads under the fibreglass spars. I am hoping to mount the battery battery where I have the reciever. I had to buy some new drill bits, and clevises.I think I will be able to get the motor mounted this weekend. After that, it is just adjusting for CG, possibly mounting my gyro (KK 2.0),and maidening her. Almost 3 months of building .... ZZZZZzzzzzzzzzz .... but who is counting ? I know, I know. It's taking a long time. I've retired my radio, because I hate it. I am waiting for my tax return to buy another. I know where you can buy a 6 channel tactic! So, I may have taken a few years off to work on my PPL, and buy a house, and have a baby. Those last two sorta killed the first one, which means I need to find another way to get back into the air. Fortunately, all of my stuff made the move with me, so I have some things I can screw around with in my garage. I think I will spend this evening going back over what I have, and what I need. This is all a long way of saying "This project is getting restarted."